Without doubt one of the most otherworldly and alien locations I have ever had the pleasure to visit and photograph is Hveravellir in Iceland. 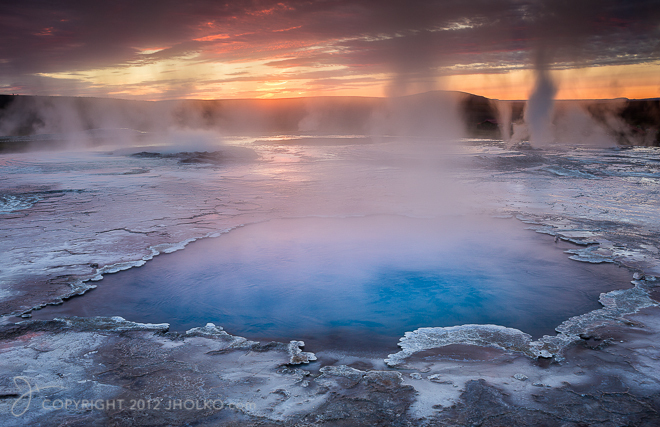 I first became fascinated with this remote area many years ago when I saw a photograph of the iridescent blue geothermal pool that lies in the middle of the barren Icelandic wilderness. Sulphur was rising from its boiling surface with what looked like ice or snow around the edge of the pool (what looks like ice or snow is in fact volcanic silica deposits). How could such a place exist on Earth? I simply had to get there one day and see it for myself. I finally did get to Hveravellir in 2010 just as the sun was setting and made a number of photographs of the geothermal features. This visit resulted in a photograph I titled “The Well of Life” that won a Silver Award at the 2011 APPA Australian Professional Photography Awards and that subsequently went on to win a Gold Award at the International Loupe Awards. It is one of the favourite photographs in my collection and a large 20 x 30″ Artist Proof print hangs in my studio today. I had a real epic getting out of Hveravellir on this first trip and subsequently wrote a short blog piece about my experience and the travel that went into the making of this image. I recently retold this story to Resource Photo.Video.Lifestyle magazine as part of an interview for their website. I will be running both Summer and Winter expeditions to Iceland in 2014 and have already received pre-registration requests to hold spaces on these trips. I am not quite ready to announce dates and details for these 2014 trips but if you are interested you can also email me at info@jholko.com to be amongst the first to be notified when bookings are opened. back to your website? My website is in the exact same niche as yours and my visitors would definitely benefit from some of the information you present here.